What exactly are probiotics and why do we need them in our diets? Probiotics are live microorganisms that help to prevent and treat some illnesses, they are a friendly kind of bacteria that is crucial to not only our gut health but our overall health as well. Our digestive systems or “guts” are the most commonly effected system in our bodies which is scary to think of because our guts contain 60-80% of our immune system. Unhealthy guts have been linked to things such as; hormonal imbalances, autoimmune diseases, diabetes, chronic fatigue, fibromyalgia, anxiety, depression, eczema, rosacea, and other chronic health problems. An unhealthy gut really is SO much more than just bloating and gas (sorry) and that is why we need to keep our guts as healthy and happy as possible.. *cough* *cough* oh hey probiotics. Probiotics can be found in foods such as; kimchi, yogurt, kefir, tempeh, miso, sauerkraut, etc. but getting enough on a daily basis just from food sources can sometimes be tough so that is where probiotic supplements come in. Now just like any other kind of vitamin or supplement there are tons of different types on the market so how do we pick the right one for us? Well a few things are important when choosing a probiotic; how may strains it contains, whether it is a probiotic or prebiotic as well as the actual number of probiotics each serving contains. I have always suffered quite seriously from digestive problems and have recently been diagnosed with Irritable Bowel Syndrome (IBS) so I personally have tried EVERYTHING under the sun when it comes to probiotics and it wasn’t until I made some pretty huge changes to my diet (one of which being including probiotic rich foods as well as a supplement) that I noticed actual changes. Most of the probiotics I have tried in the past work well at first but the dosage stays the same and eventually the effects would diminish and I would be almost back to where I started health wise. I found Silver Fern Brand on Instagram and I read great things so i decided to give them a try and reach out to them. 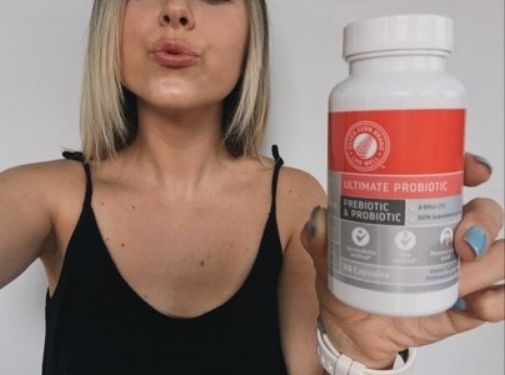 This is the first probiotic that I have taken where they recommend you start on a lower dosage and then work up to a higher one after a week of taking the supplement which I found really interesting because to me that just screamed this is really going to last! Their probiotics also contain three of the most widely used and studied strains of probiotics available today, they are also both a probiotic and a prebiotic and they are survivability verified which means the probiotics are guaranteed to make it to your digestive system. I have been taking Silver Fern Brand’s probiotics for a little over a month now and I have noticed such an improvement in not only my digestive help but my overall health as well. The effects have not diminished at all for me, in fact I feel like once I upped my dosage like they suggest I had even better results which to someone who has struggled for so long to find something that actually continues to work like this is HUGE! I would definitely recommend you checking them out on Instagram http://instagram.com/silverfernbrand they have a ton of other products that I haven’t even had the opportunity of trying yet but if they’re even remotely as good as the probiotics I am most likely in trouble (please take all my money) but in a good way right?? Last but not least I feel like I need to say this because it will probably get asked on social media BUT this is is no way a paid post, I just honestly love this product and wanted to share it with you guys! As always if you guys have any questions or recommendations of your own of products that have worked wonders for you please comment and lets chat!